Living standards have risen generally, and poverty rates have fallen across Sub-Saharan Africa since the late 1990s (Chen and Ravallion, 2013). Less is known about how different groups have fared. 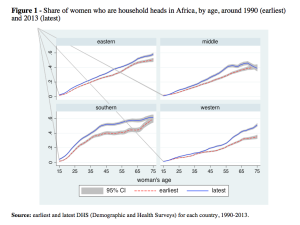 In particular, what about Africa’s female-headed households, often thought to be poorer? It is of interest to ask what has happened to their prevalence and their living standards during this same period. Has poverty also been falling for them or have they been left behind? 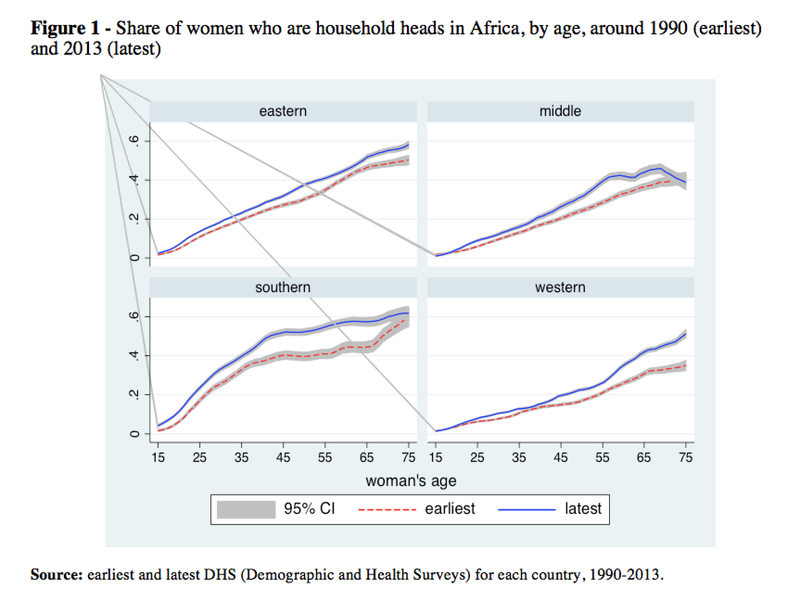 What has happened to the prevalence of female-headed households in Africa? Nearly one in four households in Africa, comprising 21% of the continent’s population, are headed by a woman. To be sure, prevalence is not the same in all countries: households in Southern Africa have substantially higher rates, at an overall 43%, while those in West African countries are least likely to be headed by a woman (15%) (Milazzo and van de Walle, 2017). The latter reflects the practice of polygamy, together with high remarriage rates following marital dissolutions that continue to be widespread in predominantly Muslim countries (Lardoux and van de Walle, 2003; Tabutin et al., 2004). What is true in all countries is that female headship has been increasing, as has the share of the population living in female-headed households, since the early 1990s. The data show quite clearly that the probability that a woman aged 15 or older heads a household has been rising over time in all sub-regions and at every age (Figure 1). What explains this notable change in household structure? Using data from the last 25 years and covering 89 percent of Africa’s population, we investigated this Africa-wide shift in a recent paper (Milazzo and van de Walle, 2017). The analysis suggests that higher gross domestic product is associated with lower female headship — presumably in part due to a decline in work-related migration by men associated with a growing local economy. So what explains the seeming paradox that female headship is rising during a period of economic growth? Subtle transformations in a number of other factors across Africa are related to this fundamental feature of household structure, including changes in demographic and population characteristics, social norms, marriage behavior and education levels. An extra year of schooling produces a three percentage point increase in the share of the population living in female-headed households (or FHHs for short). On average, a one-year rise in women’s age at first marriage produces a 2.5 percentage point increase—an effect almost as strong as that of an extra year of schooling. Life expectancy’s positive effect―equal to a 0.5 percentage point boost per extra year―presumably reflects the natural survival advantage of women that is revealed with higher overall life expectancy. This, in turn, results in an increase in widow-headed households. Conflict and HIV also raise a country’s share of population living in households headed by women. What has happened to the living standards of female-headed households during this period? How does this change in a key feature of household structure in Africa connect with poverty? We have seen that the share of FHHs is increasing while poverty has been falling. The discourse about FHHs has generally been that these households are poorer compared to those headed by men (Buvinic and Rao Gupta, 1997). So have FHHs been left behind by recent improvements in average household living standards? Maybe not. 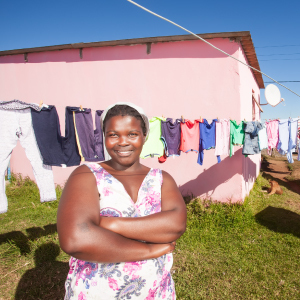 The women who head households in Africa are a diverse group. Some, such as married women with a nonresident husband (these could be polygynous marriages or a husband who has migrated for work) or women who choose not to be married or remarried (because they are educated and have social and economic opportunities to enable that decision), can be expected to be relatively well-off. Others, such as war or AIDS widows, repudiated, separated or abandoned women, and single mothers who have not ‘chosen’ headship but simply have no options, are frequently found to head disadvantaged households. So what has happened to the living standards of FHHs in the aggregate? Taking the set of countries where we have comparable survey pairs, which covers approximately 80% of Africa’s current population, we find that poverty declined for both male and female headed households. But in most countries, poverty fell faster for FHHs. This pattern holds when one allows for the diversity among FHHs. For example, it is true when comparing households with widowed and non-widowed heads, or married (or non-married) heads with and without a male adult household member. The finding that poverty is falling faster for FHHs is robust to adjusting our poverty measure for household size and economies of scale in consumption (FHHs are, on average, smaller). Looking at the different types of FHHs (widowed, nonresident husband, etc. ), we find that they follow dissimilar paths across countries and time periods, with no one type consistently experiencing faster poverty reduction than the others, yet with at least one type usually outpacing male-headed households. There is little discernible pattern across countries. One type of FHH does well in one country or time period, while another category does best elsewhere. Decomposing the change in poverty shows that, rather than putting a break on poverty reduction, FHHs are contributing appreciably to the overall decline in poverty. This is impressive given that they are a minority (at 25 percent of all households). Buvinic Mayra, Rao Gupta Geeta (1997) “Female-headed Households and Female-maintained Families: Are they Worth Targeting to Reduce Poverty in Developing Countries?” Economic Development and Cultural Change 45(2): 259-280. Chen Shaohua, Ravallion Martin (2013) “More Relatively Poor People in an Absolutely Poor World”, Review of Income and Wealth, 59:1-28. Lardoux Solene, van de Walle Etienne (2003) “Polygyny and Fertility in Rural Senegal”, Population 58: 807-836. Milazzo Annamaria, van de Walle Dominique (2017) “Women Left Behind? Poverty and Headship in Africa”, Demography, 54(3): 1119–1145. Tabutin Dominique, Schoumaker Bruno, Rabenoro Mireille (2004) “The Demography of Sub-Saharan Africa from the 1950s to the 2000s”, Population, 59(3): 521-622.